No matter your tolerance level for spicy food, the truth is that even when you request something "extra spicy" at a Thai restaurant, the kitchen will often tone it down anyway for fear that your delicate taste buds aren't primed to handle it. However, that's not the case at Hawker's Asian Street Fare in Jacksonville, Florida, where one guy's take-out order for extra spicy Pad Thai was interpreted as an invitation to make it so freakin' hot that it would "make him regret being born." While on his lunch break last week, spicy food superfan Logan Doan placed an order for extra spicy Pad Thai at Hawker's, a joint he'd never tried before. As he does at every new Thai restaurant, he made it clear to them that he didn't want a toned-down "extra spicy" version but something searing with real-deal "Thai spicy" heat. 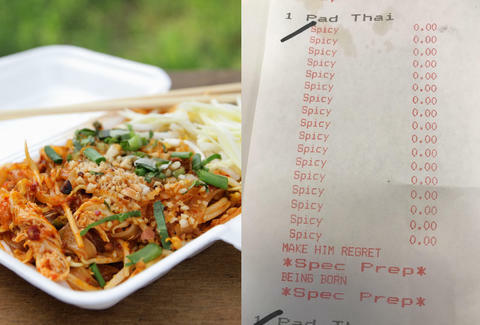 The message came through loud and clear, apparently, because the word "spicy" is repeated a whopping 17 times along with the ominous instructions to "MAKE HIM REGRET BEING BORN" on the order ticket/receipt he received with his food. A photo of the receipt, which he posted to Reddit, has since been up-voted more than 124,000 times, and has over 3,000 comments. Back at his office, Doan popped open the carton of noodles, which was scrawled with flame doodles and warnings about how hot it was. They were allegedly caked in pepper flakes, which he considered a promising sign, but he was ultimately disappointed that it didn't achieve the five-alarm heat in his mouth that he so craved. As he told the Kansas City Star, "I often push myself to the limit, and this dish wasn’t as spicy as some of the stuff I’m typically used to." A penchant for exceptionally spicy Pad Thai is one thing, but does Doan have what it takes to face down something like a Carolina Reaper pepper? Trying to eat one of those will most certainly fill you with regret.